Have you ever been bitten by a mosquito on the bottom of your foot? I have. 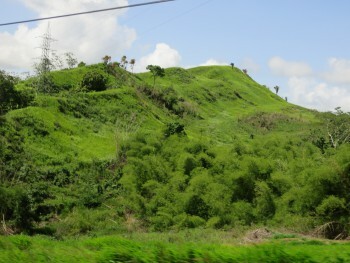 Welcome back to Trinidad! Check out the first installment in my three-part blog series on going back to Trinidad, and seeing Tobago for the first time. The flight may not have been as long as the one to Asia, but the trip was certainly just as memorable! Exactly a year to the day after my first trip abroad to Trinidad and Tobago, I found myself on a flight heading back. And I couldn’t have been more excited (or ready) for a true 10-day vacation, out of the country, off the grid, and any other metaphors for relaxing and unplugging you can think of. Best of all, I was going to see Tobago for the first time this trip! There are only two direct flights out of Miami to Trinidad each day: one in the early morning and one in the late afternoon. Since Sean and I weren’t wild about getting up before the sun rose in Atlanta to fly to the Miami airport, we opted for the late afternoon flight to Trinidad. It wouldn’t put us in ’til 10 PM, but that wasn’t a big deal. We were on vacation! Look at all the puppies around Chervon and Ethan! After a morning spent packing and running last-minute errands, we departed for the Atlanta airport, made it easily to Miami and then on to Trinidad without a hitch. Lucky for us, this time Sean had his Trinidad passport with him, so Immigration and Naturalization was much quicker than last time we arrived T&T. His mom, Suzette and her husband Louie were there to meet us when we emerged from the airport and we headed for their home in the central mountain range, next to Gordon Village. Sean’s sister Chervon and her boyfriend Michael greeted us when we arrived at home and instead of going to straight to bed after the long day of travelling (even though we’d not left until the afternoon, both Sean and I had been up early getting ready), we sat up talking and drinking (Johnny Walker Black label and Coke, of course) until almost 3 AM. Here’s the funny thing, despite the fact that quite a few nights we didn’t go to sleep till way later than normal, never once did I get up after 9 AM, while we were there – maybe it was the sun rising at 6 AM, the roosters crowing in the backyard, who knows… Not so funny thing, I’m still a mosquito magnet like no other. This time I wasn’t so caught off guard by the ferocity of the mosquitoes in Trinidad, but that isn’t to say I didn’t fall prey to them again. Even with fans, mosquito repellant wipes, etc. I still came away with bites on feet, ankles, arms, even my finger! But that’s the breaks, I guess. If that’s the worst I can find to complain about during our trip, I was doing well. I still can’t get over the fact that Sean’s family lives here and sees this everyday driving past. Anyway, our first full day in Trinidad was spent re-acquainting myself with Trinidad’s big southern city, San Fernando. Sean’s nephew Ethan had just finished with school for the year, and Chervon was on maternity leave from her job (she was due in mid-August), so we all went to town together: seeing Sean’s Uncle Douglas at his grandparents’ old, having a great lunch of BBQ chicken at a place in town called “Eat It,” and watching World Cup of course and stopping by Louie’s office to finalize last-minute hotel reservations in Tobago – we also stopped and got pow at the little Chinese take-away for later too. Sean picking zabuca (avocados) from the tree outside his grandparents’ house. Look how big they are! So flavorful too – you have no idea. After an eventful afternoon (and the late night prior), all I wanted was a nap when we got home. It was a good thing, because that night turned into a late one. We met up with Sean’s childhood friends Bryan, Sat, Naveen and Doug (who made the drive all the way from up north) at a bar named Tucker’s for a good lime that night. Nips of White Oak and Johnny Walker were flowing freely, everyone was having a great time catching up and in a flash it was 1 in the morning. Lucky for us, Chervon had come along and was able to drive us home safe and sound, and just as before, Trinidad driving gave me mini heart attacks regularly. I swear, what with people pulling over regularly on the highway, refusing to signal before turning, driving through red lights as if they were suggestions and parking as close as physically possible to other cars without touching, I was on edge like no other. I don’t think I’d ever be able to successfully drive in this country, not to mention that everything is opposite (driver’s seat), side of the road, car controls. Yeesh… Gas was damn cheap though – wish we had that in the US. 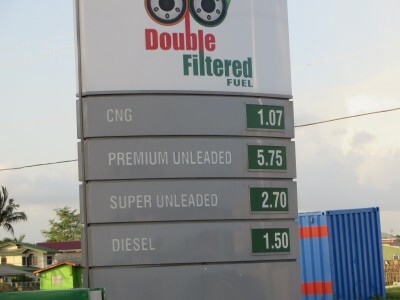 Lucky for Trinidad, gas is unbelievably cheap in Trinidad, as it comes right out of the ground there. These prices convert to about $1 USD per gallon. Saturday morning was spent eating Suzette’s legendary pastelles, and recovering from the slight hangover from the night before (at least Sean was). 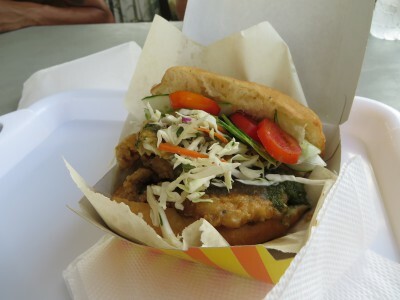 By midday though he was ready to go and craving a shark and bake, and anyone who’s been to Trinidad knows there’s only one place you can really go for shark’n’bake. Maracus Beach. On our way through Port of Spain to Maracus, we drove past Linda’s Bakery and had to stop for currants rolls and chicken puffs. The little puffs were eagerly devoured on the twisty turns to Maracus, and by the time we emerged from the jungle road, everyone was ready for lunch. The legendary Linda’s Bakery. Try the currants rolls. Sorry the photo’s blurry – the car was bumping as I was trying to take it. Chicken puff was delicious though. Since we didn’t get to Maracus until later in the afternoon, the beach wasn’t nearly as crowded as the last time around and getting a shark and bake from Richard’s was a cinch. Less than 20 minutes after parking, Sean, his mom and I were sitting at a table digging into big shark and bake sandwiches loaded with lettuce, tomato and tamarind sauce. Dear God, words don’t describe how good those sandwiches are. They’re almost too big to handle, but they’re so good. I think Sean nearly cried. 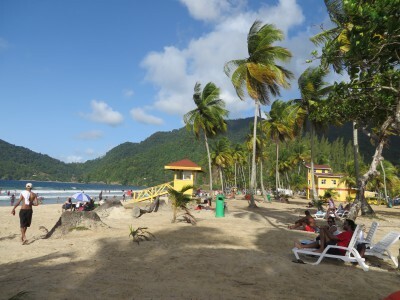 Maracas Beach – just as pretty as I remembered. I managed to kick around in the ocean for a bit – just to prove we didn’t go all the way to Maracus just for shark’n’bake (even though we kind of did). 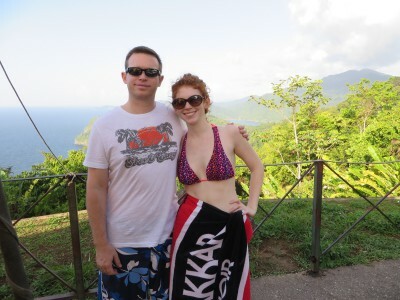 Then we took some post beach photos on the cliffs during the drive back, and by the time we were getting close to home, it was time to eat again – I still can’t get over how much I seem to eat every time I’m in Trinidad. Despite still being full from Richard’s we stopped at this great little roti shop named Alpine (how ironic in a Caribbean country, right?) and picked up chicken rotis to go. They were sadly out of buss up shut by the time we arrived. And after a quick shower at home to rinse off all the salt and sand and packing up some bath suits and t-shirts and shorts for Tobago the next day, we sat down to delicious rotis for dinner. A perfect end to a very indulgent day. And a perfect start to a great holiday. Shark and bake. The end. Don’t miss my next blog, it’s all about Tobago – the island everyone sees when picturing Caribbean islands: white sand beaches, crystal clear blue water, palm trees – the works. You are going to want to see these pictures, believe me – especially the ones from the glass bottom boat at Buccoo Reef. Quintessential picture of Sean and me with Maracas backdrop. 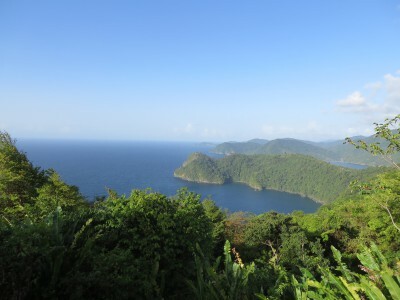 Lovely shot of Maracas from up on the mountainside. This entry was posted in Caribbean, North America and tagged Bar, Caribbean, Currants Roll, Lime, Maracus, North America, Roti, San Fernando, Shark and Bake, Travels, Trinidad, Trinidad and Tobago, White Oak on August 3, 2014 by Paige N..